I want to state on record that I am a big fan of free speech. My opinions are my own and fully covered under my free speech rights provided in the Constitution. If you do not know your rights, look into them. Retaliation by Midland Credit or any other entity can assure a firm response. I refuse to be censored or tolerate inappropriate actions by bully companies that harass people for alleged debts. If you treat your customers like dirt I will be there to stand up. Do not think for a moment that I will hesitate or that I am afraid. I eat bigger bullies on a daily basis, Midland Credit. This is your final warning publicly posted for all to see. Do not get trapped in a Midland Credit scam. 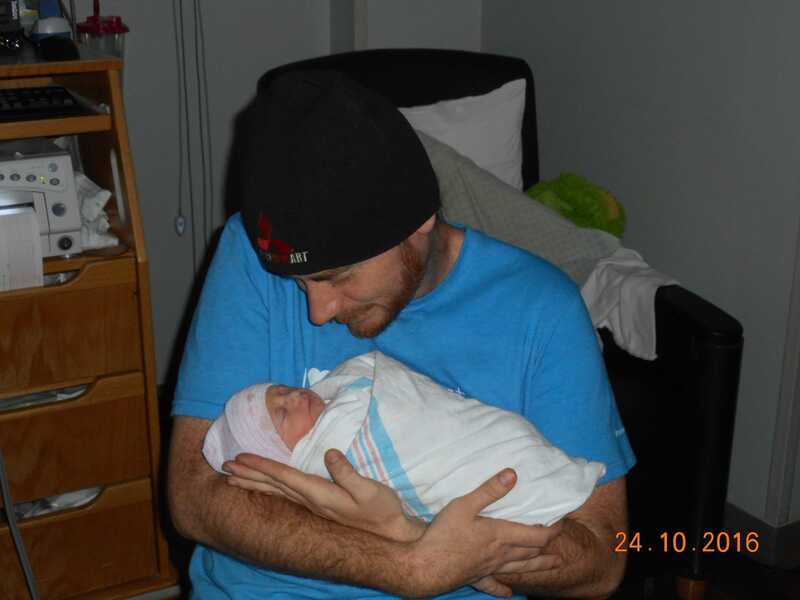 First and foremost, I just wanted to drop a brief update of how I’ve been fighting for you guys and gals. I recently sent a letter to an evil collections company called Midland Credit. For some reason, these bullies I call the Midland Credit scam think they can continue to sue tons of people for debts they cannot even legally prove! 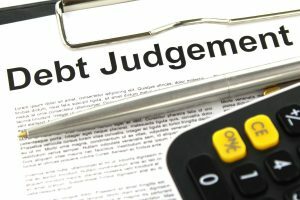 So often when confronted and proof of the debt is demanded, they retaliate by suing the consumer! This is unacceptable behavior. I’m quite certain this terrible company is violating many laws and its practices are downright fraudulent, illegal, and immoral. “Stop suing people for debts, now. I’m not asking. I’m telling you. I’m sick of hearing far too many suits coming from your company. Continue this pattern and I will personally be sure to group them up and come back hard. Counter suits will start to flow in return. “Your company continually violates fair ethics, morals, and legal business practices. A very dangerous plan with so many watchdogs in this industry. Do I need to file complaints with the FTC, BBB, CFPB, and more? “How would Midland like to see as many incoming suits as outgoing? If you think I can’t organize that – test me. I’ll be glad to earn a large payment putting you in your proper place. First and only warning. Put your dogs on a leash. Unless you’d like to see huge dogs school them on the law. “We have talked before. I was smaller then. I have gained many very powerful allies since. Your continued pattern of bad business will result in harsh retaliation if continued. This is not a threat, but a promise. Keep suing people and my legal teams will create so many countersuits for violations of the FCRA, it will make your accountants and legal teams cry from the paperwork and losses. Do not push this game. You will lose. Your trained poodles got the bark. But, these teams of pit bulls and German shepherds will tear them to shreds. Stop suing people over bogus debts of which you have no proof. 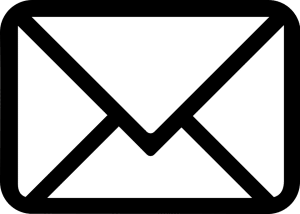 Respond properly to debt validation letters. 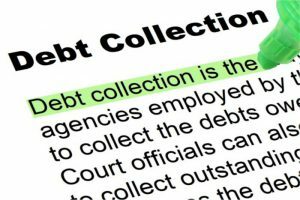 If you do not have damning evidence immediately delete the debt from your system. Your continued pattern of FCRA violations and illegalities will not be ignored much longer. I’ve seen at least fifteen suits from your company, recently. Five more and I swear on everything, I will group the twenty up to claim their fair and legal FCRA, defamation, and other damages caused by your company. We will all file complaints with the above-mentioned agencies and much more. Your company truly does not want the karma and anger it is drawing. If you think this is a fair, ethical, moral, and legal treatment of your customers you are dead wrong. Idiotic collections agencies don’t realize they catch more flies with honey than vinegar. So, I am posting this letter to the public because despite contacting the FTC, CFPB, and others, Midland Credit scam continues waves of mass lawsuits for alleged debts. Feel free to comment or contact me at rebuildrepaircredit@gmail.com if you feel Midland Credit has violated your rights or treated you inappropriately. If they continue much longer we will come back at them hard. Midland Credit should take this as a last and final warning because as of the time of writing, Midland Credit scam has failed to respond. If they ever give an official response I will post it here. So, I used my Twitter account to contact the BBB, FTC, and CFPB. I did get a response from the CFPB, eventually. 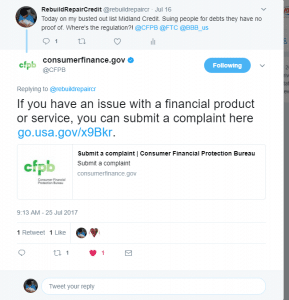 The official response so far is, “If you have an issue with a financial product or service, you can submit a complaint here http://go.usa.gov/x9Bkr.” So please, do as they ask. The CFPB is here to help consumers like us defend against these evil bullies. Next, I refuse to stand by and watch people bullied any longer. I will stand up for you all the best I possibly can because many collection companies are bullies, evil, and heartless. Midland Credit is standing up to prove that mold. Not only that, but their illegal methods and immoral standards have not gone unnoticed. So keep digging your own grave with this Midland Credit scam. Cowards attacking the weak will have their day because someone will stand up firmly and things will change for the better. Finally, please be sure to share this article with your friends and family because I rely on readers like you to stand up with me. Thank you for reading! Hope you enjoyed this article and be sure to check out my blog for tons of other great articles. Also, get a trusted completely free credit score here from my hand-picked sponsor Credit Sesame. Lastly, I greatly appreciate and love each and every one of my readers.